Tod & I both played through the Minimalism Game this month with great success. 1576 items left our apartment in 31 days. What?! I started the game thinking I didn't really have that much clutter and that reaching the goal - 496 items - was going to clear out my spaces very well. As it turns out, I lapped the game with 1080 items of my own removed. Tod did 496 on the dot. I have a lot more clutter in my life than I thought. Gathering together a group of people (the Minimalism & Decluttering Games group I started on Facebook) has made the process a delight. Everyone shared their daily decluttering stories and there was accountability to not skip days. I am pretty sure it would have been a drudge and I would have quit otherwise. I can't remember 99% of the things I decluttered. Things that come to mind: the orange phone & a stack of party plates...and that is all I recall without looking at the photos I took. The more clutter I removed, the more I realised there was to still get rid of. Even now, I could easily play the game again and will in March. We've accumulated and saved things from a lifestyle that has changed quite a bit over the 13 years we've lived in this apartment. Guilt plays a big role in hanging on to things too long - it was hard to dispose of gifts or things we "paid good money for" but rarely use. Minimalism doesn't mean austerity; it means not having excess. There are lots of people who are happy to have the strangest things you might want to give away. Donating items in Japan isn't easy, but the we gave clothing to a Syrian refuge charity drive, and the Salvation Army has a donations center that was happy to take my random assortment of stuff at the end of the game. I think moving things out of my life has given me mental room to invite friends and ideas back in. I am trying out the idea of a very minimal wardrobe. I put away all of my clothes except five layered outfits, two pairs of pyjamas, and four each of socks and underwear. I've got one sweater, one fleece, one coat. Four pairs of shoes. It's been a week since I started and I am enjoying the benefits of not having to make too make decisions about what to wear. I am even thinking I could get by with one less outfit. But then again, I might swap for something to train/exercise in. It's currently a little bit fluid as I discover what I really, truly need. For the moment, all of my clothes are stored in a big bag in the closet. I'm going to give it a month or so and then see if I can release them into the world to be loved by other people. Like I wrote last week, I'd actually like to have a personal uniform. So I've found myself a dressmaker, Melanie Uematsu at Sewing Circle, to remake one of my favorite dress/tunics in four different fabrics. I met with her today, got measured, and picked two lovely knits from the collection at her studio. I'll go shopping to find two more that coordinate. Once my uniforms are ready, I'll retire what is currently in my closet and everything in my wardrobe will mix or match with everything else. I will be able to dress in the dark with no mistakes. This appeals to the minimalist in me. I do it when I travel, so why not do it at home, too? Tod & I are planning to move house this spring and we are also striving to simplify and downsize. We've been in our current apartment for over 13 years, so even though I frequently purge things, moving is going to be painful. So I was sort of delighted when Tod agreed to play the Minimalism Game with me. Every day for 31 days, you get rid of things. On the first day, one thing. Two things on the second day, three on day three until you are getting rid of 31 things on the final day for a grand total of 496 things removed from your house. Aside from actual garbage like wrappers and orange peels, you can choose to remove anything from furniture to clothes to supplies to food and you can count your items any way you want. A handful of hairpins could be one thing, or it could be 18. The only real rule is that each day's gleaning has to leave the house by midnight, or it doesn't count. So by the end of 31 days, Tod & I will have removed 992 things from our house - 496 each. I mentioned this on Facebook and started a sort of support group, Minimalist Game Japan. In less than a day, over 50 people have joined. We're sharing our accomplishments day by day and ideas are flying, including doing it backwards - pitching 31 on the first day and ending with one item to remove. If everyone last the 31 days (in whatever order), we will have minimised by 25,296 unwanted items. Today I got rid of two broken lights. Tod tossed two red gift boxes. I also lined up homes for about 35 small things from my jewellery box and other accessories, so I am rather ahead of the game at the moment. I missed writing the June report on my ongoing experiment in non-consumption, so this one will do double duty. I feel I failed overall. I bought a few things and I haven't gotten rid of nearly as much stuff as I wished to, but I have been mostly mindful. I will work harder at it this coming month. Pared down my shoes by almost half. Planted a delicious garden of herbs, tomatoes and newly flowering chili peppers. Used some old hair dye. Interesting color results. Broke some drinking glasses; didn't replace them. A summer blouse and a summer dress. I haven't discarded anything yet - but I will. LED mini hoops.This was a work-trade barter from a hoop friend, so it's actually partially on target. Buugeng. Bought them from Dai Zaobab while he was in town. A flow toy I have wanted to play with for years, but...new stuff. A pair of character shoes and some performance costume pieces. But earned money with them. A pair of orange pillows for the Tibetan bells to rest upon. Here I am, a month into my experiment and I can't say I have had great success but I am not totally failing. I think I am doing OK on the giving away part, not so great on the purchasing part. Acquired another tent (the Peanut) from Tracey for GGC. I returned from Spark! Circus with a renewed distaste for consumerism. We don't need everything that is offered to us, and there are some ridiculous things being sold. Walking through the shopping districts of Tokyo was painful. I started to avoid going into areas of town where every nook and cranny is dedicated to selling something. Having lived out of a small backpack for four months while touring with WHD Dance and in the circus, I realised I can be happy with very few resources. Even my desk is untameable. The pencil cup overflows. Why do I have so many pens? Do I need four Sharpies? Three pairs of scissors? Yes...? No? I use them if they are there. Would I miss them if they were not there? Argh. Don't get me started on hoop workshop materials or art supplies. 9. One in, one out. 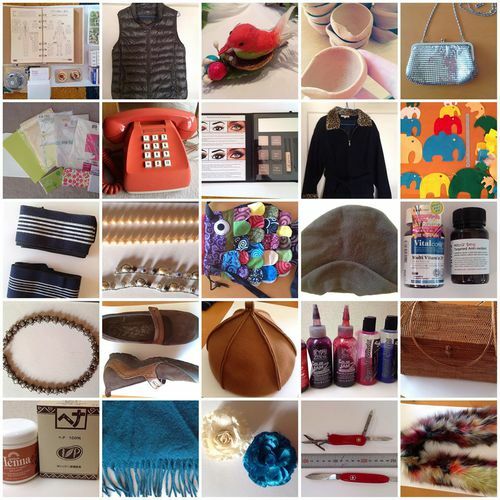 For 2013 I am also putting more emphasis on giving things away, including things I love. I will be clearing out my clothes, coats (ouch), shoes (oh! ), kitchen cabinets, hula hoops and flow toys, books, and all the little things that weigh me down. Assessing what is important to me and what I really don't need. And then I will try not to shop. To keep myself honest, I will report here monthly. If you are keen to play along, there is a closed group on Facebook called "Make Do, Do Without 2013". Drop me a PM over there and I will add you. There is no good reason to have as many clothes as I own. Later this year I will be living out of a backpack while I travel for a month and I'm hoping to repeat the backpack era again at the beginning of next year, so the seasonal wardrobe change is a good time to give my closet a thorough cleaning and asset reduction. 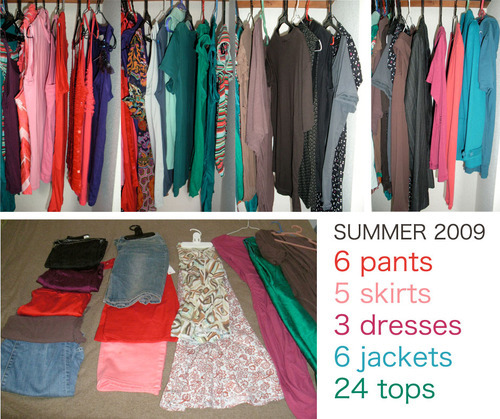 Let me plan what I will be travelling with and see how I go over the summer on a significantly reduced wardrobe. I've realised out two problems I have when cleaning out my closet: guilt and love. The solution to these problems is multiple sorting in two phases. There are pieces of my wardrobe that I love. They fit well, they serve multiple purposes, they have memories attached. In one way or another, they make me feel good about myself and about owning them. That is not a problem. But what is a problem is letting go of them when they are well and truly worn out. So when I clean my closet I have a pile for "Things I Love" and everything I really love and feel I need to keep goes into that pile. There is a second pile for "Basics I Think I Need." These are things that I wear frequently. Black leggings. Tank tops. Various foundation pieces. Socks. And there are clothes in my closet that I'm not in love with at all or don't wear much any more but don't want to part with. It would make me feel guilty to get rid of them. They were expensive or gifts or I thought I'd love them but didn't or they don't fit unless I am at my very thinnest (but then they look terrific). They go into the "You Are Hurting My Feelings" pile. There are always a few items that I know I need to give away to a better home. Those go into their own pile to be packed into a box or bag for donation. This is the "Give Away" pile. Off to the side is "Trash Bag". This is for any clothes that have obviously outlived their time and would not be welcome at a clothes swap or donation box, like odd socks, ratty pajamas, and items with damage. It stays pretty empty in the first round. Now the Things I Love and the Basics I Think I Need piles get another look. I start by making some outfits. It feels a bit like a fashion edit, 5 Pieces = 25 Outfits! Can this item I love be coordinated in multiple ways? Yes? Put it away in the closet. No? It's Give Away for you my friend. And then a final check - are all my coordinating clothes in good condition? I tend to wear things out, so if something's shabby can I (and more importantly will I) repair or refresh the item? If the answer is no, then it goes from the closet to the Trash Bag. Bye bye! And then the You Are Hurting My Feelings pile gets sorted. If I am feeling strong and ruthless, I use two existing piles - Give Away and Trash Bag. 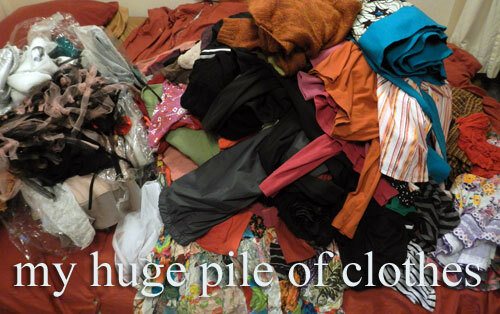 If I am feeling weak, I make a third pile, Maybe Another Day, for things that are going back into the closet for another try. At this point the trash bag is getting full, the closet is restocked and it is time to attack the coats, shoes and accessories. At the end of last year, I decided to try not buying anything except consumables for the whole of 2009. It was a pie-in-the-sky project with vague rules and no real consequences or penalties for failure. I blogged my progress and this is the final report. The first few months sailed by smoothly. I restricted and restrained myself for about half a year without too much pain. I kept a wish list of things I wanted to buy but wouldn't. I retrained myself to not shop as a waiting game. The plastic smell of shops became unpleasant. 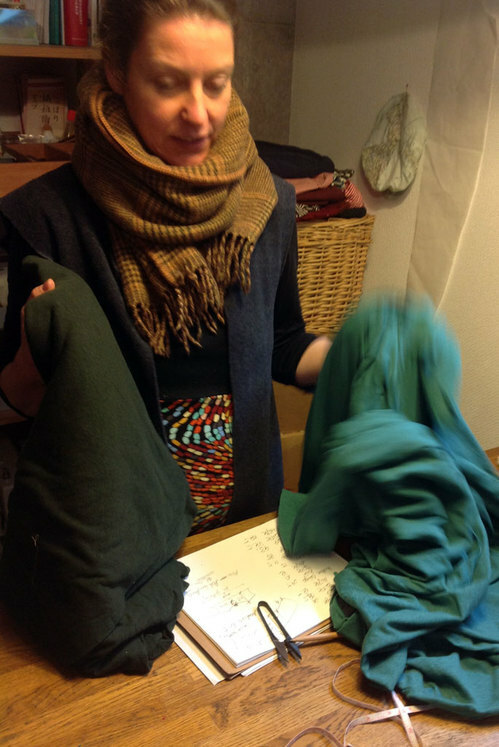 My main failures were supplies - fabrics and hoop tubing - and gifts for friends and family. When summer came, I gave in more easily to shopping temptations for myself. I bought some clothes and more fabric. Cosmetics sneaked into the house and so did a new pair of sneakers to support my sprained foot. I stopped keeping my journal in August. Autumn arrived with flurry of buying for Spin Matsuri, partially materials for the event itself and partially costumes for me. Our trip to Thailand and Singapore saw purchases of books and clothing. I replaced my filled up sketchbook with a new one. I bought an old, used telephone that I have wanted for years. And in the last month, I have caved in to the point that I bought all of my Christmas gifts and not many of them were consumables. Shopping is a slippery slope. It is hard to put the brakes on and so very easy to get rolling again. Here is my scorecard, based on the original goals I stated last December. Partial success. I ended up with more hoop costumes, hoops, makeup, and clothes than I started with but most of the durable goods I purchased were given away as gifts. Success. However, consciousness and conscientiousness slipped later in the year. Partial success. I had a few good moments, like the shoe clips in May, but I found this surprisingly difficult. Partial success. Though I did repair and maintain things, I didn't do so with new or improved skills. Partial success. I bartered and traded with friends as I always do, but did not build new networks. Partial success. As an example, I eked another year out of our 12 year old mattress and put the 5 year old computer in for repair instead of replacing it. Fail. I still want hula hoops. They are meaningful to me. This month has been illuminating. As seems typical, very few of my purchases will remain in the house. I've bought gifts for friends' birthdays and supplies for Spin Matsuri and other hooping events. I think I can justify these things without guilt. I splashed out on a trio of Uniqlo shirts & a pair of purple leggings to fill in little gaps in my wardrobe - I've already worn all of them but I could have survived with out them, so that was a fail. I bought a hat at a flea market. The woman and her smiling baby made me feel good about it, so not too much of a fail. I also put together an emergency kit in case of earthquakes - resupplying our stock and adding some new essentials. That is a "I hope this is never consumed" item that I do not regret or feel at all guilty about shopping for. Tod & I started tracking our daily purchases, including monthly bills & transportation costs. Basically anything that comes out of our wallet gets marked down in a notebook at the front door. It is surprising how much money we spend, even without many durable goods. Our daily average is 12,000 yen for the past month. That is pretty amazing, since I don't think we spend huge wads of money. But I guess I have the notes to prove we do. Where does it go? Well, utilities are high, we don't skimp on groceries, we are generous with gifts and we eat out a couple of times a week. Trains and taxis cost us 34,000 this month; utilities totaled over 30,000; I had a 5000 yen hoop class; the emergency kit set us back 8,000 yen; Tod's workday lunches about 1000 yen daily. So anyone who thought I was going to ruin economic recovery by not shopping...you were wrong. I am still spending plenty of money. At least not too much of our cash is spent on things that persist. 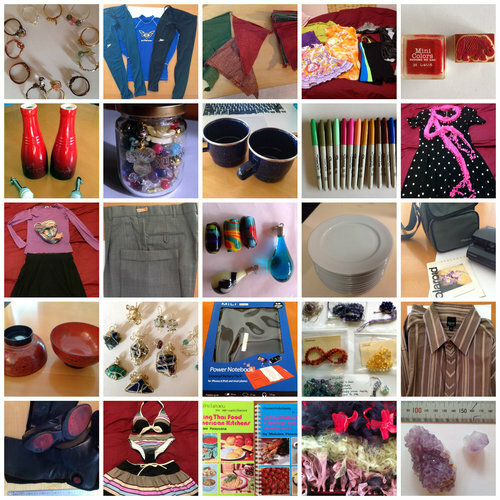 Long report: I have a lot of interesting new clothes, many of them from a second-hand shop. 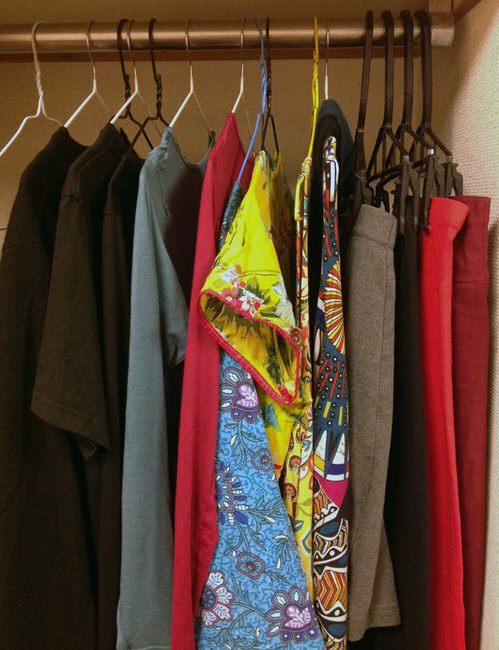 Of the above, two pants, two skirts, one jacket, and three tops are brand new; one skirt and five tops are second-hand. In other words, 14 of my 44 wardrobe pieces are newly purchased. It was my intention to go window shopping with Jeanette last Sunday, not to actually buy things. It was meant to be a lesson in cut and color but the clothes fit so well and they were on sale...I got stuff at 3 different stores. Here is my shameful accounting: 8000 yen at H&M for 2 skirts, 2 pants and a jacket; 7000 yen at Zara for 3 tops; and about 9000 yen at Kinji for a skirt and 5 tops. I should feel guilty but I have a completely coordinating wardrobe that gets me compliments when I wear it. With so many matching pieces I will be able to don a different outfit every day for the rest of the summer (and the next couple of summers, too), so I have no reason to want any more clothes. Shopping is a slippery slope. Now I want shoes and accessories. Sigh. Brakes on. Can not have. Clothes weren't my only fail this month. Feeling the sadness of not having any glowing toys for our weekly evening spin gatherings, I bought 4 Cyalume LED glow sticks to make glowing poi. They are quite spectacular in motion. 890 yen each. I knitted the leashes myself, at least.